Warrnambool is situated on the Surf Coast of Victoria, 260km southwest of Melbourne, and is the eighth-largest city in regional Victoria in terms of population. The city is the region’s main service centre for retail, business services, health and education. Located along the Great Ocean Road, Warrnambool is also a major tourist hub. Part of the Great South Coast region, Warrnambool’s diverse housing stock, services and amenity features attract a range of new residents: young people to inner urban centre, young families to new developments, mature families to the more rural areas and older people to established areas. New greenfield opportunities to the north-east and north of the city, as well as in Dennington, provide opportunities for large-scale residential development in Warrnambool over the next 5 to 20 years. As one of the main towns on the Great Ocean Road, life in Warrnambool revolves around the ocean and pristine beaches. Fishing, surfing and boating are all popular activities. Warrnambool Art Gallery offers a diverse collection of artworks ranging from the romanticised colonial landscapes, to contemporary Australian printmaking. The recently redeveloped Lighthouse Theatre in Warrnambool’s cultural precinct hosts a variety of large contemporary productions each year and also offers intimate spaces for grassroots theatre. Warrnambool has approximately 2,950 businesses and a workforce of around 14,000 people. It is a major centre for food manufacturing with an emphasis in dairy products, sheep and beef processing. 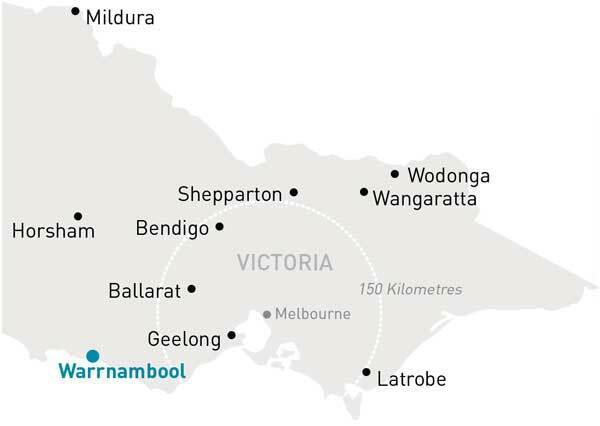 The Warrnambool region, which is renowned for its clean green environment, produces 25 per cent of Australia’s milk and 30 per cent of Victoria’s beef and lamb. Health care and social assistance is the most significant sector in terms of output and the second biggest employer. Retail trade and education and training are also major employers in Warrnambool. In the five-year period 2009-2014, there was strong employment growth in arts and recreation services; electricity, gas, water and waste services; health care and social assistance; accommodation and food services and other services. There continues to be significant investment in dairy and meat processing plants. There is a capacity for the expansion in the production of quality food from the region. Warrnambool is also experiencing industry growth in new and emerging energy industries, as well as in dairy, timber and mineral sands. Retail trade, education and property, business, health, community and personal services, have also grown over the last decade. Population-driven industry sectors, such as retail trade, education and property, business, health, community and personal services, have also grown over the last decade. Warrnambool Airport is aiming to receive a major upgrade to position it for future growth. The project, if implemented, would improve the existing infrastructure and services for businesses already located at the airport, enabling them to expand and capture growth opportunities. The RDV information portal page has more detailed data and statistics on the Warrnambool region and regional Victoria more broadly.